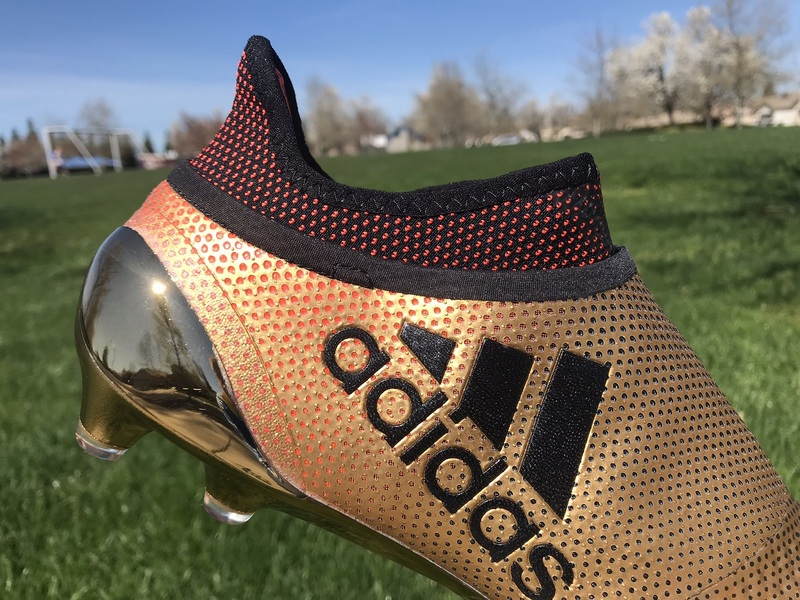 What is better than your favorite boot layered in a beautiful Gold paint job? I’ve had these for a while and completely forgot to detail them in a post, so I figured they would be ideal to showcase on a quiet Tuesday in the run-up to this Summer’s World Cup. 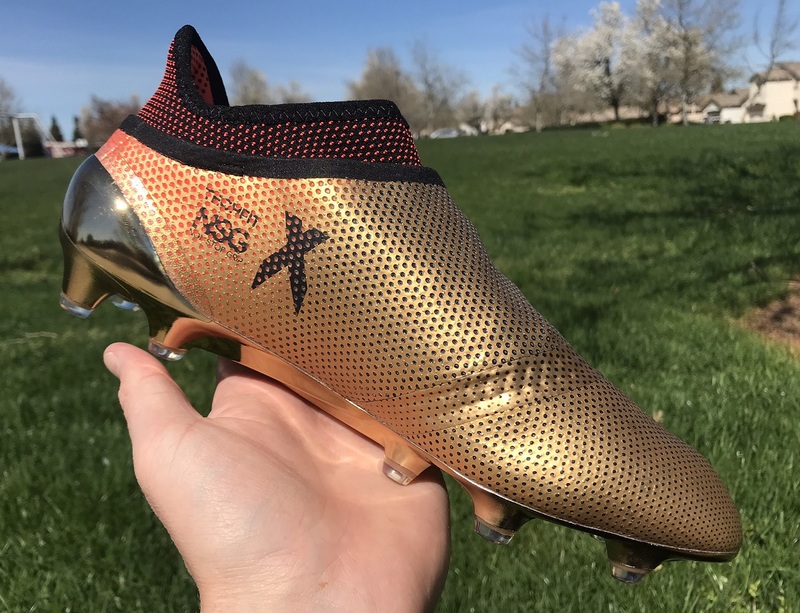 Listed as a pretty graceful Tactile Gold Metallic/Core Black/Solar Red, they are one of the best colorways used in the adidas X17+ Purespeed series. 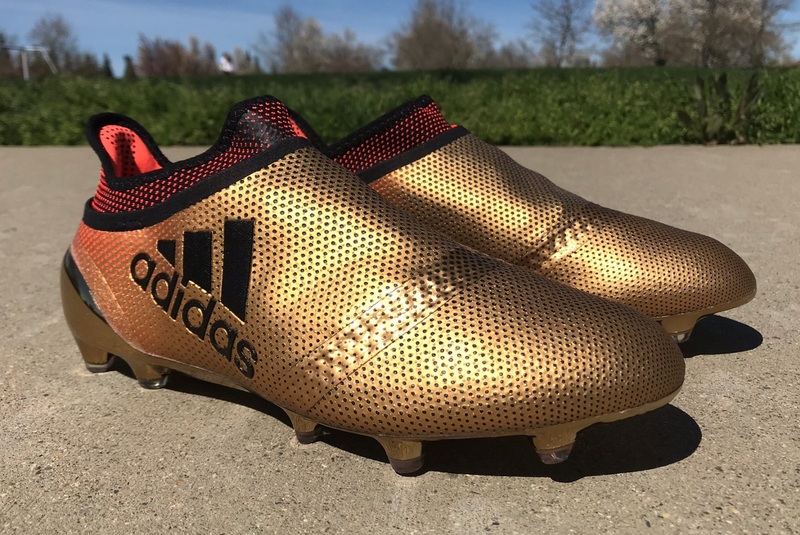 Rather than being a simple style gold boot, adidas has amped up the detailing with a blend of Solar Red dots that run through the heel of the boot and through the mid-cut collar. It is subtle, yet effective in providing a pretty unexpected look. 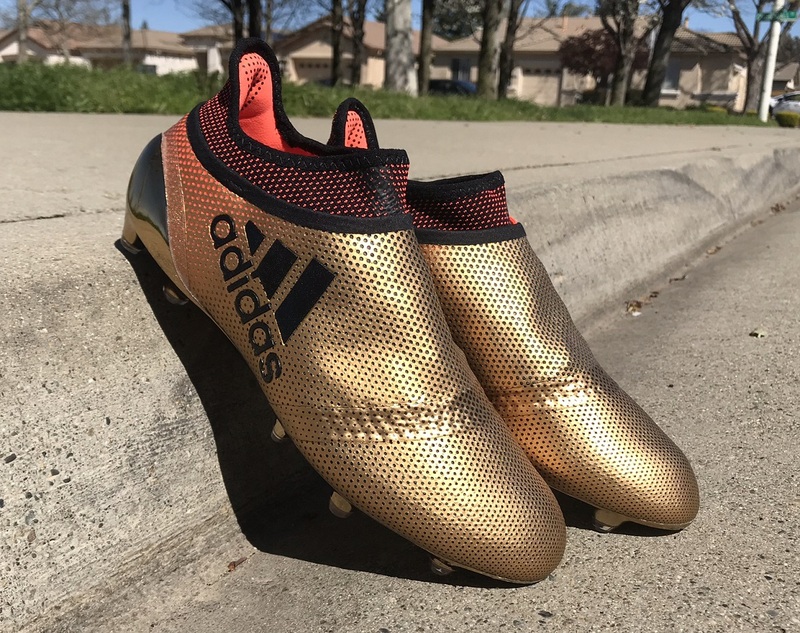 Turn them over, and you will find an absolutely glorious Gold Chrome soleplate on offer – designed to make those players chasing you envious of what you’ve got on! Unless you are going to try find a pair on eBay, this particular colorway is sadly not readily available anymore. But, they are still worth a quick up-close look, as this is one of the best complete colorways we’ve seen in recent times. They are quality! For a boot that is built primarily for speed, the upper (although not cushioned) has a nice natural feel when controlling the ball. Since the laces are hidden underneath the upper layer, the flatness and smoothness doesn’t allow much room for excuses when failing to control a pass, something I sometimes greatly depend on! The sprintframe outsole along with the stud configuration allows you to change direction quickly, and with the right sizing should be adequate to stop you from sliding inside the boot or rolling your ankle! For obvious reasons, the last thing you want going into a practice session is doubts about sizing of your footwear. As far as adidas boots go, these definitely have the most spacious fit. Because of the style of the upper, they do cater to players with wider feet. Even with my medium/wide fit, I did notice a bit of movement from side to side through play. It is a personal choice but I prefer my cleats to be nice and snug, on occasion even going down a half size to get that secure fitted feel. 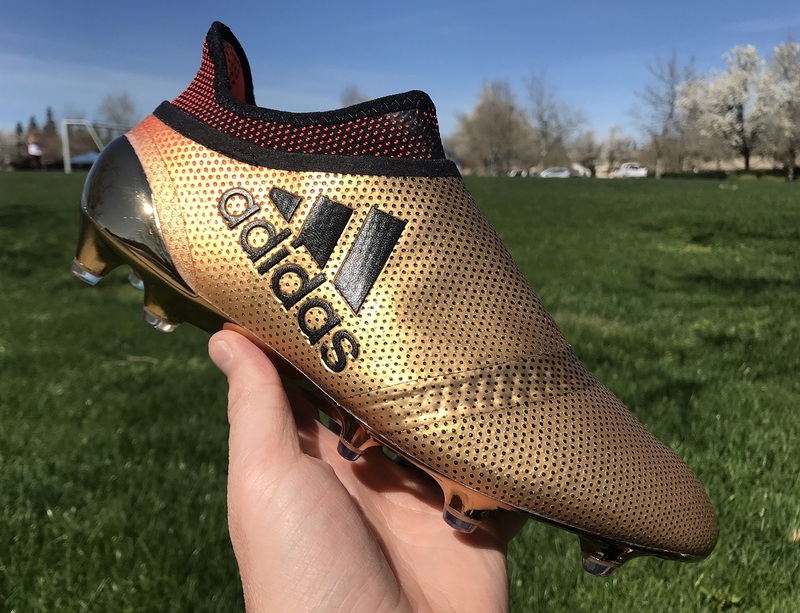 I will give Adidas this, for a cleat that is built for speed, they are surprisingly comfortable. There was no breaking in period, I did not have to put them in a hydrocollator initially, and there were no blisters even with the movement I experienced. The pure cut sock in this boot greatly adds to the comfort. Having a higher positioned tab at the back allows you to easily maneuver in and out of the cleat. So, this particular colorway is unfortunately sold out in retail. They were officially the fastest selling boots in the entire Purespeed series. Popular. You can find pairs available on eBay but as you’d expect prices are pretty over inflated. 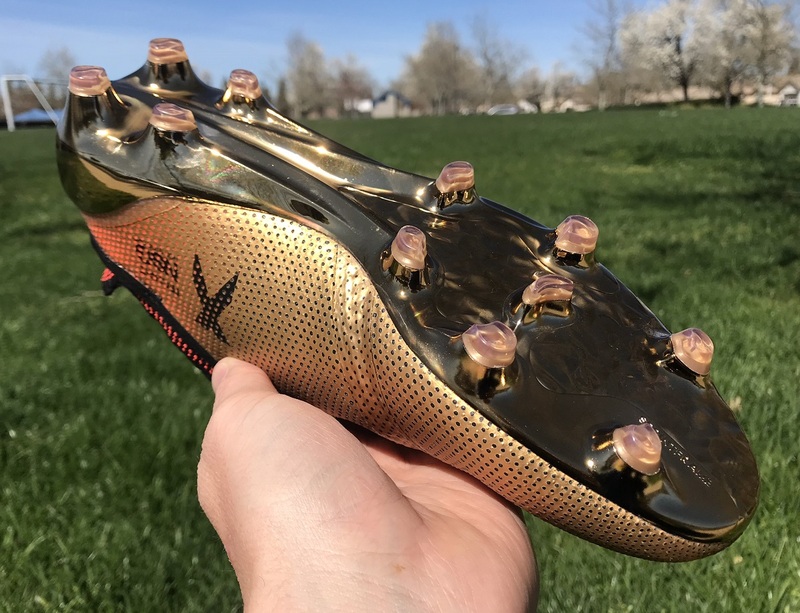 If, however, the general Purespeed series is something that you are interested in, check out the entire available line-up at soccer.com.